Matt Syler, beloved father, grandfather, and great grandfather passed from this world into eternal life on Saturday, November 9, 2013. Matt was 86 years old. Born to Monnie Lou Glimp Syler and Hubert Syler on January 27, 1927, Matt was raised primarily in Buda and Chimney Springs, Texas, and the surrounding areas before joining the United States Navy where he became a Corpsman near the end of World War II. He received the American Theatre Medal, Good Conduct Medal, and Sharpshooter Tag. Afterward, Matt pursued his dream of working on a ranch in Wyoming. While sending money home to his mother and younger siblings, he worked at the Stephenson Ranch in Tie Siding. While working on the Wyoming ranch, Matt learned a lesson he said he would never forget – “how to tell what a cow was about to do” – a lesson he used for the remainder of his life. When he returned home to Texas, he began his studies at Texas A&M University earning his degree in 1951 in Animal Husbandry and Agronomy. He was a member of the Texas A&M Rodeo Team and competed at the Cow Palace in San Francisco in 1950. During the summers at A&M, Matt worked at the Lazy H Ranch near Kerrville, Texas, where he met his wife Gloria Ann Reeves, and the two married in 1950. After graduating from A&M, Matt and Ann worked for Herman and LeNan Gardner managing Willow Springs Ranch for 21 years. It was at Willow Springs that Matt was able to live out his passion of working with cattle and growing coastal Bermuda grass while making a name for himself as an honest, trustworthy, and knowledgeable cattleman. Matt joined IBBA in 1951 and was a founding member of the Texas Brangus Breeders Association (TBBA) in 1956. He later served as TBBA secretary from 1958 to 1966 and served on the association’s Board of Directors for nine years. In 1971 Matt began his own ranching operation and sales management business, Syler Sales Management. He managed the first International Brangus Sale, founded the Sealy Bull Sale and was also instrumental in launching the first Houston junior show. Matt was honored during his lifetime with many awards. He received multiple honors from his Brangus Breeders family but the highest honors were his 2000 Brangus Breeder of the Year and 2009 Pioneer Brangus Breeder awards. He was the Secretary of the Brangus Breeders Association for eight years and served two terms as a director of the International Brangus Breeders Association (IBBA). Matt volunteered at the Brenham Memorial Hospital, volunteered as a reader for a Brenham elementary school, and was a Bread Partner volunteer for several years distributing bread to the needy of Washington County. He was also proud of his title, “Tale Twister” for the Lions Club of Burton. In addition, he was an original member of both the Beef Cattle Short Course and Washington County Wildlife Society. He was also involved in the Walk to Emmaus group for many years, ministering to countless others about his personal relationship with Jesus Christ. Matt and Ann had four children: Lee Bentley, Jeb Stuart, Melanie Ann, and Darla Ann. Both Ann and Bentley preceded Matt in death, as did his sister, Peggy, and brothers Scott and Jim. Jeb and wife Alma live in Richmond, Va.; Melanie and husband, Tim, live in McKinney, Texas; and Darla and husband, Candido, live in Richmond, Texas. Matt’s grandchildren include Tanya Syler Thomas (husband Jarred and children Taylor, Jace, and Adrianna); Matthew Syler III (sons Daylon and Payne); Cori Willett; Chase Willett; Bentley Syler II; Chris Syler (wife Claudia and son Lucas); Kevin Syler; Ana Maria Syler; Lindsie Gibson (husband Mitch and twin sons Connor and Colton); Jamie Pagan (daughters Haylie, Maykayla, Heather, and Allysa); and Chelsie Pagan; and one great-great granddaughter, Maya. Other family members include Martha Syler of Athens, Texas; Silvia Syler of Bolivia; and Dilia Syler of Houston. In addition, extended family includes the Cerda Family who has been an important part of the Syler family since 1957 – Maria, Maggie, Elva, Cerjio, and Abel. Visitation was November 12, 2013, at Brenham Memorial Chapel, and funeral services were November 13, 2013, at Brenham’s First Baptist Church with Rev. Troy Sikes officiating. Interment followed at the Val Verde Baptist Cemetery in Milam County. The family has asked memorials be given to The Wounded Warrior Fund or Washington County Wildlife Society. 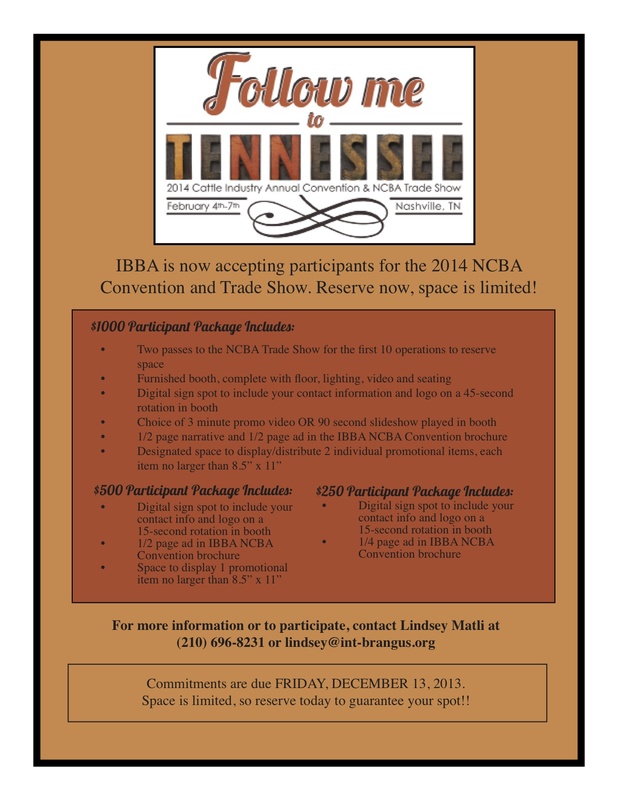 Partner with IBBA and come face-to-face with other cattlemen at the National Cattlemen’s Beef Association (NCBA) Annual Convention and Trade Show February 4-7, 2014, in Nashville, Tenn. The oldest and largest convention for the cattle business, the NCBA trade show provides a unique, fun environment for cattle industry members to come together. Do not be the one missing out! Join us in Nashville to help promote Brangus. Download the flyer for package options and more information. Commitments must be made by Friday, December 13. Email Lindsey Matli or call her at 210-696-8231 today to reserve your spot in the GoBrangus booth! SAN ANTONIO, TX [Nov. 11, 2013]– The International Brangus Breeders Association (IBBA) named Emilio Silvas the new Product Manager and joined the Brangus team in October. Silvas will serve the IBBA and the membership managing current product lineup and providing updates and support to existing members and clients. Silvas has extensive experience with software development and product management. He grew up in San Antonio, Texas, and obtained a Bachelor of Science degree in biology from Notre Dame in 1992. Concluding his college education, Silvas performed cancer research for 10 years where he worked in a lab, produced research papers and wrote and patented software. Before initially working for the IBBA from 2008-2011, Silvas established, successfully managed, and later sold his own web development corporation. After his three-year period at the IBBA, Silvas gained valuable experience working for an online social media company for two years that had a very large online presence. He left as the product manager and lead developer where he managed every aspect of the company’s technology platform from software to servers, including other development personnel. Most recently, Silvas was employed as an application developer for Gore Design Completions, Ltd., a high-end airplane interior redesign company. “Emilio is an expert in his field, and we are excited to have him join the Brangus team,” said Tommy Perkins, Ph.D., IBBA’s Executive Vice President. “He will be an excellent addition to the staff and will be able to successfully extend product services to our IBBA clients as well as the other three associations we service. Silvas and his wife, Katherine, have three children, Cruz (nine), Marelys (eight), and Miguel (four). Katherine is the Director of Economic Development for the city of Converse, Texas, and both are very active in city organizations in San Antonio. 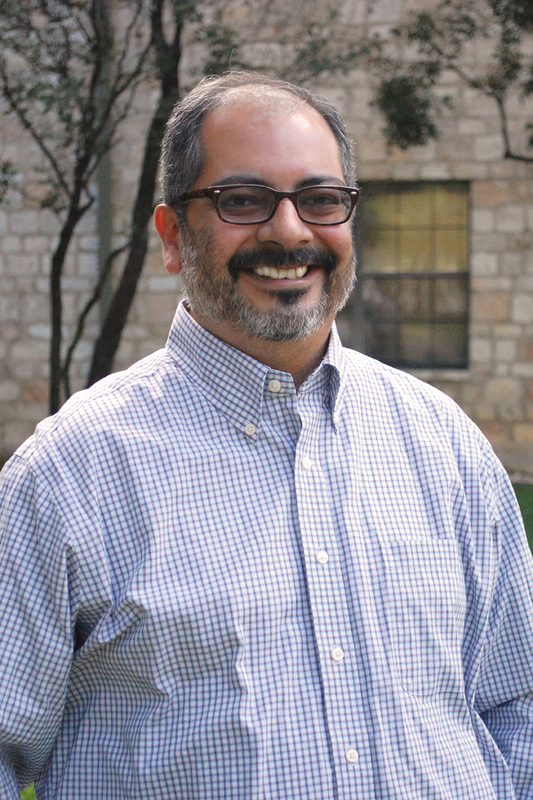 Silvas was appointed by the City Council to serve two consecutive terms on the San Antonio Ethics Review Board, and he was also in the South San Antonio Chamber of Commerce Leadership Program, which assists in developing and teaching young entrepreneurs. Silvas is very involved with the Episcopal Diocese of West Texas where he is a youth minister and served on the IT Committee. In addition, he was also an instructor trainer for the American Red Cross. For more information about the IBBA, visit www.GoBrangus.com. View Silvas’ contact information on the contacts page. 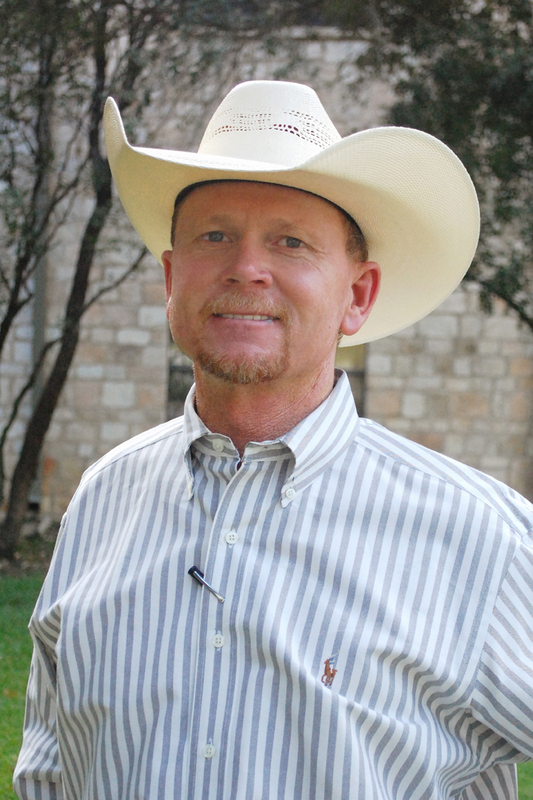 SAN ANTONIO, TX [Nov. 8, 2013]- International Brangus Breeders Association (IBBA) Executive Vice President Dr. Tommy Perkins will be a guest speaker at the Third Annual Beef Improvement and Low Stress Cattle Handling Seminar scheduled for January 11, 2014. Hosted by University of California, Davis in conjunction with the FARM CLUB, several relevant cattle industry topics will be addressed at the seminar. Perkins will present at 11:30 a.m. on the topic of docility- 60 years of selection in beef cattle. Click here for a complete schedule of events. Perkins is most well known among industry professionals for his extensive research and experience using ultrasound technology. While teaching at several universities, including Texas Tech University, Texas State University and Missouri State University, Perkins accomplished an outstanding career measuring body composition in beef cattle using ultrasound technology and has been a certified ultrasound technician for more than 20 years. He has traveled to Brazil, Canada, Colombia, Costa Rica, Mexico and Venezuela to train beef producers, college professor and veterinarians how to use ultrasound technology to improve carcass merit in beef cattle. A native of the Texas Panhandle region, Perkins received his bachelor’s and master’s degrees from West Texas A&M University in Canyon, Texas, and he received a doctoral degree in Animal Science with a specialization in animal breeding from Texas Tech University. Other presenters and topics on the program include Dr. Temple Grandin on cattle behavior and improving handling facilities as well as setting up and implementing auditing programs for cattle and other food animals; Dr. Catalina Cabrera on reproductive strategies for beef cattle; Dr. Anita Varga on correcting dystocias in beef cattle; Dr. Frank Mitloehner on sustainable technologies to feed more people; and others. For more information about the seminar, visit the UC Davis website.